I’ll be honest. There was a time when I thought design didn’t matter. To my credit, it was a long time ago… but I used to think, if the tool was good enough, the design won’t matter, people will use it cause it is helpful. (This may or may not have influenced some fashion choices earlier in life as well – I’d like to think things have improved – but not everyone may agree it has improved sufficiently). Being useful may be sufficient (although take a look at the government website at the bottom of this post – it’s a very useful website). But it’s no excuse for not making things easier to use. Especially when you are running an open source community and want to encourage participation and ease people up the learning curve faster. Hence why I enjoyed recently discovering ActiveState’s implementation of Bugzilla (re-themed by Tara Gibbs). 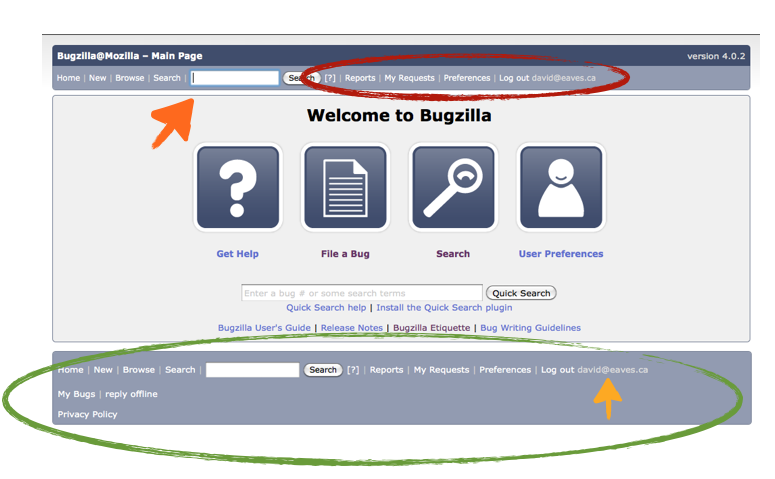 Bugzilla is the software many open source projects use to identify, track and resolve bugs. Here we have two identical pieces of software (so the “usefulness” is the same) but what makes ActiveState’s version of Bugzilla so nice are a few simple things they’ve done to make it more user friendly (doubly pleased to see them implement some ideas I’d blogged earlier as well – great minds think alike!). So let’s start with the Mozilla instance of Bugzilla – as this was the one I was used to. Dark orange arrow: the search button! most often you won’t find a search box located here in an application. Light orange arrow: another log out option… didn’t I see that somewhere else as well? I want to be clear, the Bugzilla team at Mozilla is awesome. Recently hired they are trying to do a ton of stuff and this is not where I’d expect them to start (and they’ve been super responsive to everything I’ve blogged about so I’m a huge fan), I want to flag this because everyone, from software engineers to government officials need to recognize that we rely on good design to make our lives easier, to help with decision fatigue and streamline our work, every day. Now check out the ActiveState version of the exact same software, but re-designed. So, my cartoonish circles and arrows are mucking up the design and ascetics of both theses sites, so please forgive that. (I suggest opening them in adjacent tabs – Mozilla here, ActiveState here – so you can see them uninterrupted). Red circle: Now everything to do with the administration of your account is in the top, top right hand corner. This is where Google, Facebook and most websites put this info now, that’s why you’re expecting to find it there! Dark orange arrow: now the search button is in the top right hand corner. Pretty much the same location it appears in Firefox (and safari, IE, chrome, OS X, etc…) and so where users have come to expect it. Green circle: This part really is genius. 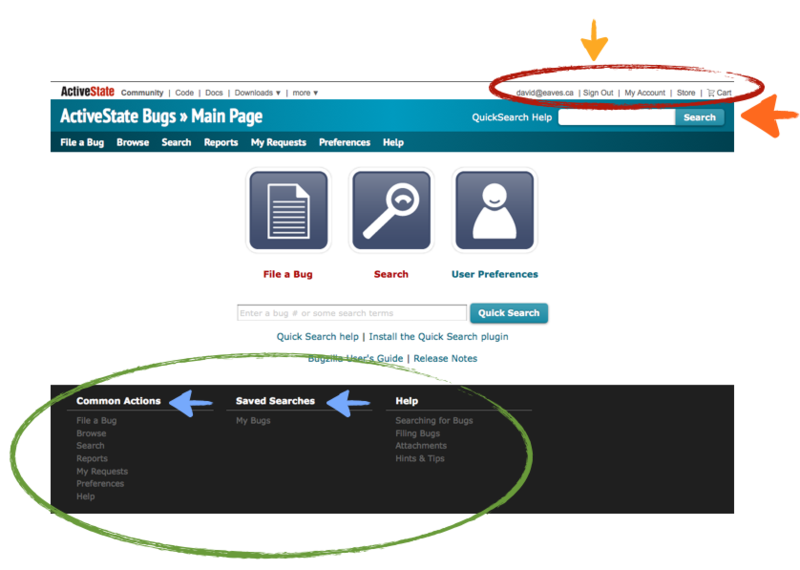 Did you know there were saved searches in the above version? There are, but the feature didn’t stand out. This theme sorts the users options and displays them vertically within a menu: much, much easier to digest quickly. My point is that a few minor changes can dramatically improve the usability of a website or tool. Is Mozilla’s bugzilla radically worse than ActiveState’s? No, but I definitely prefer ActiveState’s design. Moreover, when you are relying on volunteer contributors and attracting new contributors is something that matters to you, this is an important gateway and so you want it to be as seamless as possible. What’s interesting is that often it is in the non-profit and government sector that design gets neglected because it is deemed a luxury, or the “substantive” people don’t think design matters and so ignore it. The results can be disastrous. This entry was posted in commentary, mozilla, public service sector renewal and tagged bugzilla, design, mozilla on August 22, 2011 by David Eaves. Talking about design, the choice of using two arrows with only slightly different shades of orange is not the best… However, I still agree on your arguments! That ActiveState is nice and dandy, but how does it work with people who use bugzilla for the real work and have (like me) 40+ saved queries? This is hardly scientific, but pretty much everyone at Mozilla I’ve shown it to has indicated a preference for the ActiveState version. There are also several Mozilla employees who used to work at ActiveState who were the ones recommending this to me. So, I’m sure there would be those who would find moving to be a challenge, but my sense is that heavy users are the biggest fans as, well, they use it the most so a better UI helps them the most. Hopefully we should see some of this stuff in a release soon. Hi Gerv – this is great! Thank you for point me to this! Funny you should mention the Canadian government websites. The standards for them are indeed numerous and antiquated: http://www.tbs-sct.gc.ca/clf2-nsi2/index-eng.asp. I know… Common Look and Feel (CLF). The dead zone of good design. The maddening thing is, something like CLF could be useful in defending user experience. But the CIO’s office would have to let go of the control-freak aspects of that document and instead orient it toward consistent presentation of key elements based on usability principles (e.g. 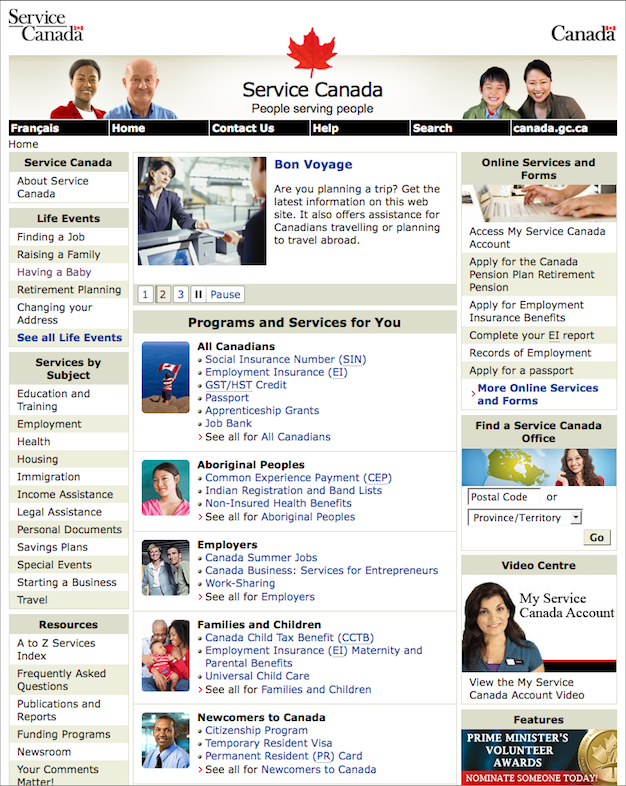 the utility menu will always be *here*, the search field will always be *here*) and high-level guidance on usability and branding, while recognizing that various ministries, agencies and services have a dramatically different array of users and use cases. I think what I’m trying to say is, that common menu bar is a crime against god and nature.